DiskBank offers a wide range of USB drives, which are small flash drives. 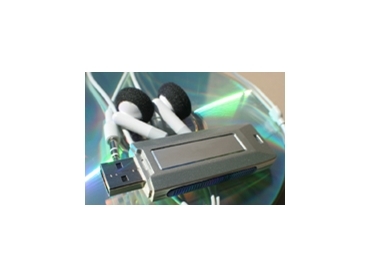 The USB drives are beginning to slice into the corporate demand for CD and DVD duplication. USB drives are small, compact and can fit into a pocket, on to a keychain, into a pen, a wallet or on to the human wrist which is not possible with a CD. USB drives can be coloured and branded with a company logo. This branding remains on the desk of prospective clients and customers long after the message has been seen unlike a CD or DVD which tends to be discarded or filed away soon after use. Because of the inherent reusability and durability of USB drives, they represent suitable gifts to potential clients once the message has been consumed. If the message needs to be upgraded on a regular basis, new media need not be expensively reproduced. Some USB drives come with the data authored in such a way that ensures automatic web delivered updates much the same way as Windows updates itself. Failing this level of customisation, clients can be encouraged through simple email links to download upgrades on to the USB drive which can replace existing digital pricelists, brochures, and product lines. USB drives come in a diverse capacity range from 64Mb up to 32Gb and beyond. Fingerprint drives are beginning to edge ahead providing a much needed security option for portable data, which is currently lacking with the use of CDs and DVDs.